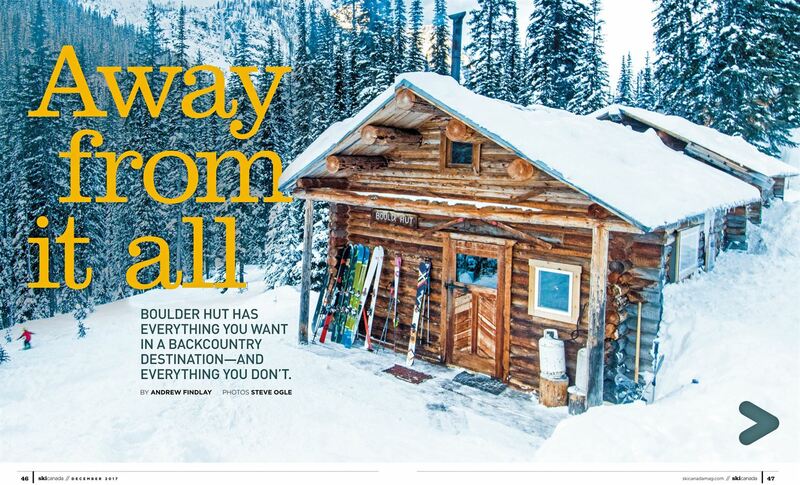 Boulder Hut has everything you want in a backcountry destination—and everything you don’t. It was as though my worst nightmare and best dream were set for a parlay in the mountains. I was going to be trapped with a pack of millennial Instagrammer influencers for three days, but in a backcountry ski lodge set in a remote valley of the Southern Purcell Mountains that had captured my attention since I started thinking about backcountry skiing. The dream, however, trumps the nightmare. If you were to search for ground zero for the proliferation of commercial backcountry lodges in B.C., you could do no better than Boulder Hut. During a January deep freeze, I, along with my 183 Instagram followers, boarded an A-Star helicopter at the base of Kimberley Alpine Resort wedged next to a young social media celebrity who lives with her parents in Alberta, goes by the hashtag Goldie Hawn and has a gazillion followers. I missed that Instagram train and frankly the term “influencer” makes me uncomfortable, however I’m stoked to have slipped through the cracks of social media and scored a seat on this so-called “content-gathering mission” in the Southern Purcells. The helicopter hovers above Kimberley Alpine Resort’s base area then noses westward, cruising over a series of corniced mountain ridges. The snowpack gets noticeably fatter the deeper we travel into the Purcells. Ten minutes later we pop through a windswept col, then circle into the forested valley of Boulder Creek and toward a heli-pad cleared from the trees a short stroll away from Boulder Hut, a rustic-looking log structure from which smoke drifts lazily from the chimney into the frigid January air. The hospitable Yancey family, Americans from the Pacific Northwest and current owners of Boulder Hut, are there to greet us. Over a bowl of soup around the dining table, I chat with Mark and his wife, Sarah, and it’s clear they feel they are the stewards of a wonderful backcountry skiing legacy. “I stumbled across this place by magic when I came here to do an avalanche course years ago,” Mark tells me, recounting the trip that led to a meeting with then owner Margie Jamieson in 2004. 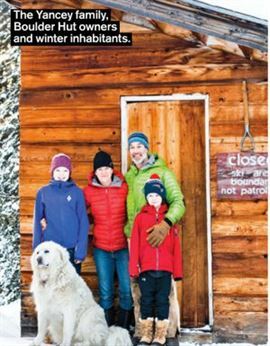 What followed was a decision to scrape together some financing and buy the operation, a leap of faith that would also come with the responsibility of raising two kids, Grace and Alden, now 13 and 10 respectively, at least part-time in the mountains of B.C. They haven’t looked back. Boulder Hut has a colourful history. 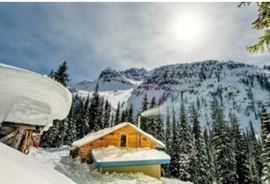 It’s a story of people with ideas and ingenuity building a dream in the wilds of B.C. It’s a story about how the Diaspora of Vietnam War resisters was America’s loss and Canada’s gain. In the late 1960s Art Twomey fled the tumult of Vietnam War politics in the U.S., leaving his flatland home of Wisconsin for the rugged topography of the East Kootenays. Almost on a whim he ventured deep into the Purcells that summer with friends to build Ptarmigan Lodge, and started exploring the terrain in winter in an age when telemark skis were 75mm underfoot and 220 cm long. Ptarmigan Tours was born at a time when the concept of a commercial backcountry skiing lodge would have seemed as implausible as a ski resort in Florida. 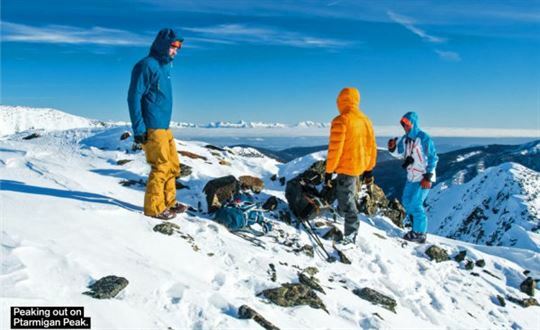 For Twomey, the idea of running commercial ski touring trips evolved after the fact, and it proved popular. So popular that in 1984 Twomey and his life partner, Margie Jamieson, who had joined the operation in the early ’70s, added Boulder Hut, situated higher up the same valley and closer to bigger terrain. Sadly Twomey died in a helicopter crash in 1997 at the age of 52, but he left behind a considerable legacy. During his adventurous life, he became a leading avalanche expert and educator, mountain guide and alpinist, not to mention a conservationist who played a key role in the protection and creation of St. Mary’s Alpine Park, which laid the groundwork for the Purcell Wilderness Conservancy. Twomey’s lanky frame and bushy-bearded mug became synonymous with backcountry skiing, and he and Margie welcomed many guests and friends to Boulder over the years. That night we find our spots in the Casa de Sueños, the bunkhouse separated by a narrow, open-air breezeway from the dining room and kitchen. In the morning I’m amped. With only two days here, I’m keen to make the most of the high-pressure blue skies and bomber stability. As the social media “content gatherers” head out across the landscape to, uh, gather content, I gravitate to a group that includes long-time Kimberley resident Pat Bates, fellow photographer Steve Ogle from Nelson and several others. A well-beaten trail leads down from the hut, across Boulder Creek then up through slide paths and glades toward the alpine. Twenty cm of low-density fluff sits atop a well-settled early-season snowpack, but temperatures in the morning shade are a bitter -20C. We hustle upwards, aiming for the sunshine that now blazes a subalpine bench of larch trees below the steep untracked shoulder of Crosscut Peak that had caught our eye from below. After a quick snack we continue, angling upwards on a ridge before kicking awkward switchbacks to gain the shoulder. Easier travel leads us to where the slope abuts impassable cliffs. The snow feels delicious under the skis and its promise delivers when we drop in for the first run, downy light Purcell powder peeling from the ski tips. With the up track already in, we decide to session this dreamy snow for a few more laps before traversing across this alpine cirque to explore more terrain. That evening Mark Yancey guides the dinner conversation toward the topic of Internet access in a backcountry hut: To have it or not to have it? An awkward subject for a group of people who live and breathe by “likes” and page views. Unless you tackle a full-on wilderness expedition, there are few places left on the planet where you can go and not encounter people, heads bent toward smartphones or tablets, immersed in a reality that is alternate to the actual one in front of them. 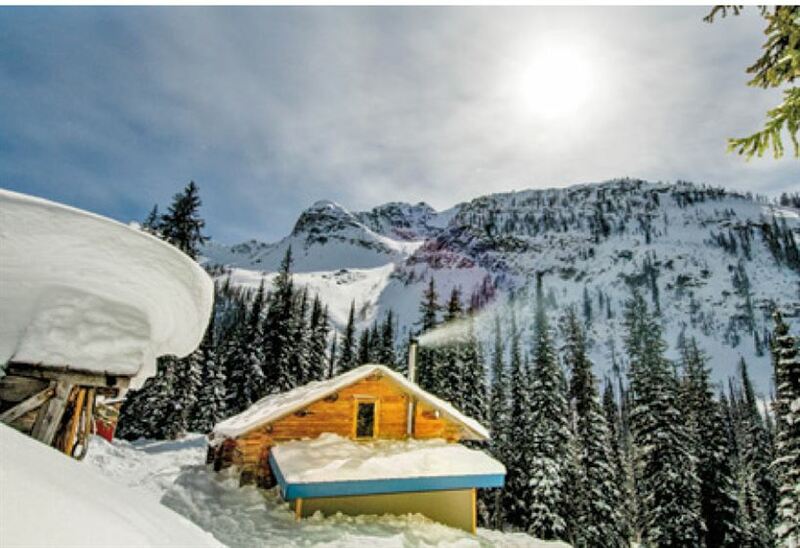 Backcountry huts used to be one of those digital detox sanctuaries, but not so much any longer. “One of the things we’re trying to do here is to offer a place where you can get away from the Internet. You can learn so much from people by simply sitting around the table and talking eye to eye,” Yancey says. Still, Yancey expresses a concern that by doing so he will alienate potential customers who nowadays expect to be plugged in all the time, everywhere. So he canvasses the group, who collectively know much about the power of the Internet to persuade. Surprisingly, the opinions are unanimous—keep Boulder Hut unplugged. The following morning, as our group of four climbs a trail south toward Ptarmigan Peak in the brilliance of a January morning, I can’t help but think that Art Twomey would be pleased with the results of last night’s informal poll. After all, he left his home in Wisconsin for the mountains of B.C. to get away from the nasty politics of the Vietnam War and to get closer to nature. And let’s face it, it’s hard to do that with your face buried in a smartphone. We break out of the trees and traverse across a bowl ascending toward a moraine and bench before approaching the final 35-degree, spicy convex slope. A handful of switchbacks later and we’re standing on Ptarmigan’s summit, snow on the exposed ridgetop tortured by wind into a hard crust. From there we can see a thin line of woodsmoke spiraling above Boulder Hut in the valley far below. To the east across the Rocky Mountain Trench, The Steeple and Fisher Peak dominate the horizon. With a slight breeze, the cold air cuts to the flesh. We rip skins off and turn our attention to the thousand-plus metres of vertical that awaits. In the history of backcountry skiing lodges in Canada, this is hallowed ground, and it was high time that I visited to pay my respects. And you know, those young Instagrammer hotshots aren’t so bad after all—even they need a digital detox every once in a while and what better place to do it than Boulder Hut?